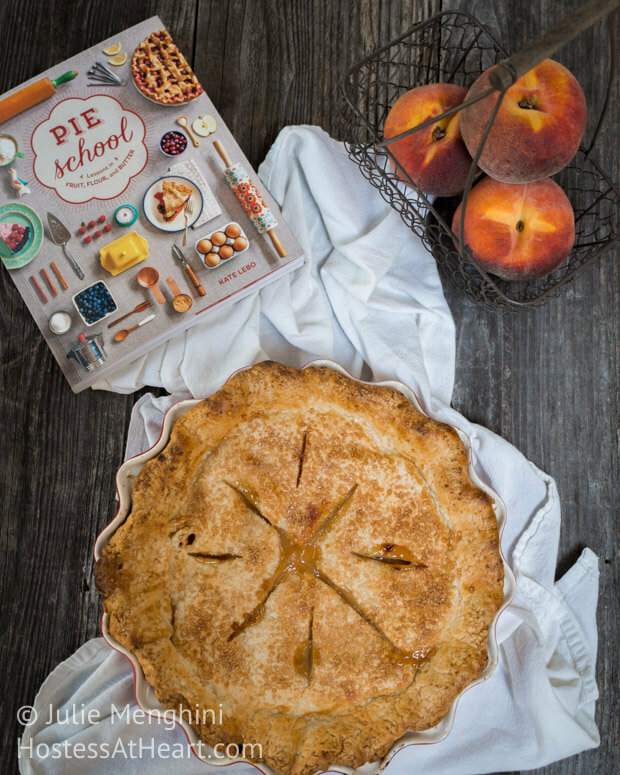 Kate Lebo, author of “Pie School” says “it’s just pie”. “It may not look the best but it’s going to taste good” Just have fun! I often say that I wish I would have known more about opportunities in food when I was young. I worked in a local cafe and Dairy Queen, but had no interest in a career as a waitress, chef, or line cook. But a pastry chef or a baker? I would have loved that! John just casually mentioned that a friend of his was having a class on baking pies in his home, and had another opening. I think I scared the poor boy with my enthusiasm and told him to get my name in. It paid off, I got the opening! Kate Lebo was the instructor of our class. 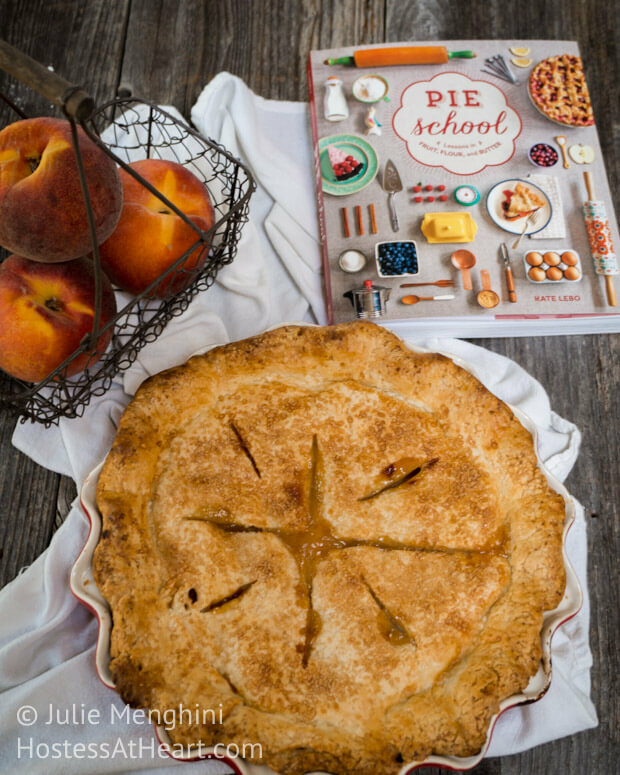 Kate is the author of Pie School: Lessons in Fruit, Flour, and Butter. She has family in Omaha and was visiting after judging pie at the Iowa State Fair. She was such a wonderful teacher. Her attitude was “it’s just pie”. “It may not look the best but it’s going to taste good”. I learned so much from this class. Another great thing is she didn’t flunk any of us! Our only homework was to teach someone else to make a pie. It is very difficult to read or watch pie instructions and be able to do it. It’s one of those things that you have to feel. It is an art that is disappearing. That being said, her book is wonderful. It is entertaining and instructional. This is the pie I made the next day for practice. It’s the Peach Whiskey pie from Kate’s book, and it was delicious! This wasn’t the first pie that I have ever made, but it’s the first pie that I felt that I knew what I could do to get a better and more consistent outcome. A huge thank you to Kate Lebo! UPDATE: I now make my crust (most of the time) and am so grateful to have the confidence to do so. Just look at this Pineapple Cream Meringue Pie! She’s a beauty don’t you think? So good you’ve got that spot! I’d love to take some pastry classes too 🙂 Meybe something to look for in the future 🙂 Your pie looks great! Well, I truly hope that pie making is not becoming a lost art! 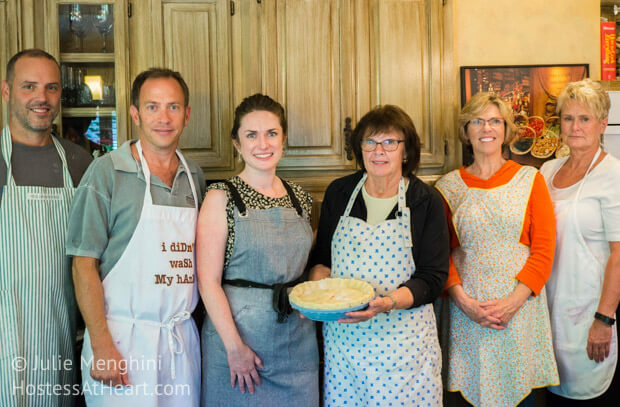 I took a course on pie making last year too and I had so much fun, so your post really resonated with me! Haha! This would be a fun event for FF, don’t you think? A pie making day! That would be a great event for FF! I’m in. I need to practice while all her lessons are in my head. Thank you Jhuls! I had so much fun. I would love more opportunities like this one! It was a wonderful pie Judi. It could use a bit more whiskey though! The flavor didn’t come through very well. I loved the flavor and texture of the crust though and now need to practice more. I had such a great time. Wish I had access to a lot more of these classes. How much fun to be able to do something you love. Pie class is something I wouldn’t mind going back to school for! I want to be the sampler. It really was Patti! I would love it if you could stop by for a sample. Thank you Angie! I would much rather eat pie than cake too. I always had a hang up on crust though so very happy I had the opportunity to take the class. Happy FF Angie! Great opportunity and fun experience at the same time! I can almost feel your enthusiasm! I’m sure you learned a lot! Great pictures! Thank you Ana! I had so much fun. I would love to have opportunities like these on a regular basis. Wow! How exciting. I would have been equally enthusiastic.I wish I was in it too. Never mind I know you will teach me how to. Lovely job. I would love to teach you! We would have a lot of fun! That is a beautiful pie Julie! 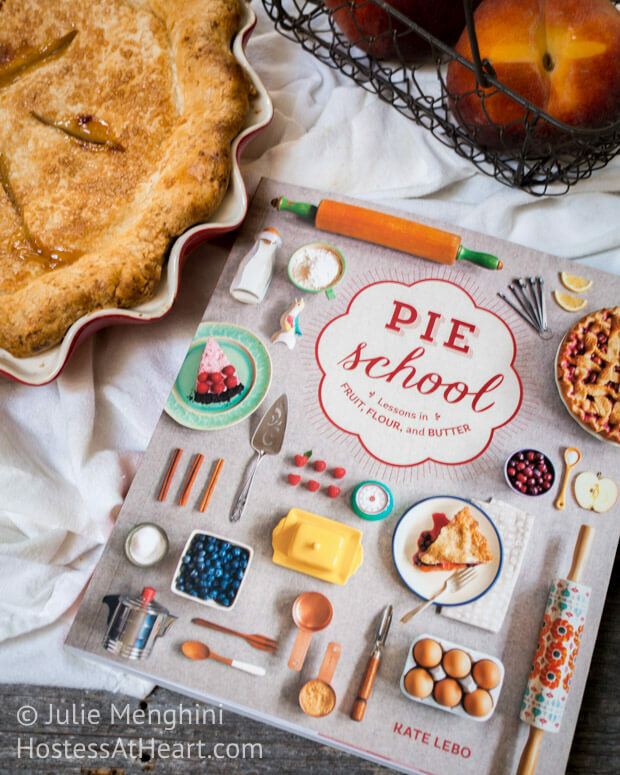 I need to get my hands on that book and make some pies! Thank you Dini! It is a great book Dini, and I don’t say that lightly. I think you would enjoy it because it does get into the nitty gritty of why things work so you can apply them to your own recipes. I really did too, and need to practice! With fall coming, I should get plenty of it. Oh my gosh, Julie! That is a gorgeous pie! The filling sounds heavenly, too. I would love to take a class on pie baking. That sounds like so much fun, and a great way to learn. I have always been intimidated by pie crusts, too. Thanks for sharing your beautiful pie! Thank you Shari! There are tricks for a great crust so I don’t feel crazy for feeling intimidated. It is just a matter of someone showing you. I wish I had more opportunities for learning events such as these! I am hearing that so much! I think there are people that can teach, but they just aren’t aware of the need? You could do a class on that beautiful stuffed chicken you made! Let’s make that peach whiskey pie when I’m there in Oct…. Are there still peaches then? You are on Leslie! I have some stashed in the freezer! We will have a pie class with WINE!!!! Yea!!!!! Can’t wait!! I haven’t even told Jessica! Me either! That will be fun! Aha, so that’s what it was – I kinda figured you had passed with flying colors based on the look of that pie on FB. What a marvelous opportunity, don’t you just love gatherings like that and a nice sauvignon blanc to boot? You were lucky enough that they had room for one more. 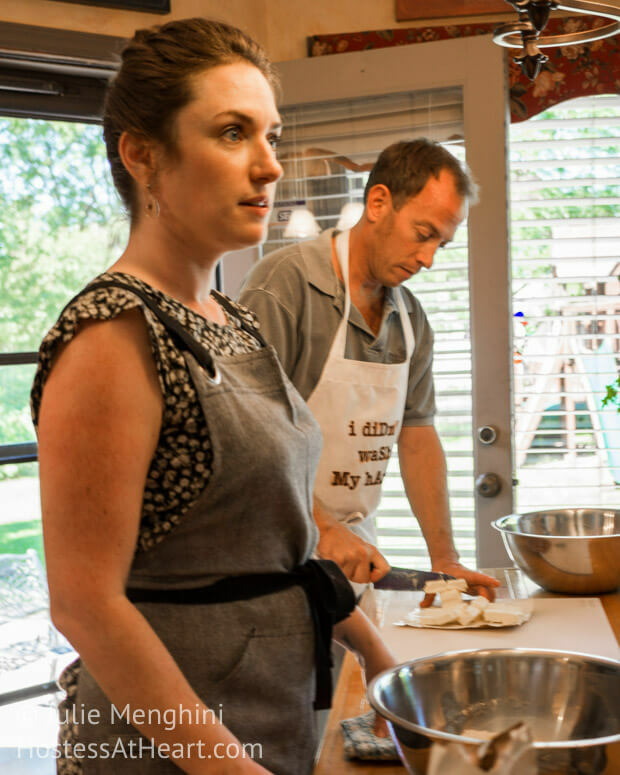 Perhaps in time, you’ll feel comfortable giving lessons yourself to amateur bakers. So tell me, canola oil or crisco for a perfect crust? I love taking courses like this, and always told myself that I would like to take them in different countries when we visit. So far I’ve only had a lesson in Madrid for paella and sangria. 4 others cancelled at the last minute, so I had a private lesson which was amazing! A great experience overall I’m sure. Paella and Sangria in Madrid? Oh heavens, what an opportunity that would have been! We actually used all butter, but she stressed using a good quality butter with a high butter fat content. European butters are good and we used Kerry Gold. You can use any kind of fat that stays solid at room temperature, so Crisco but not canola. You could use Coconut oil too! I think John and I are going to take some classes in Italy next summer. We’ve talked about it and hope that works out. I am actually tutoring one person on cooking. She’s been a physician her whole life and never took the time to learn to cook. Last month we made falafel and she couldn’t believe that she actually made it. This pie was so good. The crust was so flaky and buttery. She was such a kind patient person and made everyone feel like a pastry chef! What a fun experience, Julie! I wish I could have joined you! 🙂 Your pie and your photos are absolutely beautiful! Thank you so much Anna! We had a ball. Wouldn’t it be a great time if we could all meet in the middle and just cook our little hearts out? We have to get this figured out Anna! I would love that too! What fun! How lucky you are. How fun! Lovely pie 🙂 I would love to do more classes like these. It’s nice to polish your skills every once in a while! Thank you Sarah! I really enjoy watching others do what they do. I always pick something up. I really got a lot from this class! Thank you Lili! I am very discerning before I buy a book because I’ve purchases some that I never opened in the past. This book is wonderful. It has great illustrations and explanations. It is also has a lot of her own personality in this book. I did have to fight the crust because it was 90% humidity and very warm, but boy was it delicious! I served it to guests and it didn’t last long. I agree Lili! I quit buying a lot of cookbooks for that reason too. You have one sweet blog my dear. I just surpassed 35 years of marital bliss. John and I love to cook together, but he is more of a grill man. I’m the indoor cook and baker. Thank you so much for stopping by! Your squash pie sounded yummy! I say you passed with flying colors. What a great class. There is nothing better than a homemade pie crust. Thank you Quinn! I have to admit Quinn that there were many pies made with store bought crust because I just let the stuff intimidate me. I could do the slab pie crust because they were so forgiving, but other than that I was just winging it. I really enjoyed this class. Lovely:) wish you would teach me..XD.. Thank you! Come on over Lina we would have a ball! I know Lina! There are very few foodies here :(. Jenny I agree with everything you just said. It always drove me crazy that I didn’t make my own crusts very often. Even my mother made hers and she wasn’t much of a cook. I had so much fun and agree that these traditions need to be kept alive. Thank you so much for stopping by and your sweet words. She is a pretty gal, but I was kind of the odd person out since they were all friends and I was the unknown. It sure was a lot of fun though! Our host did serve a wonderful Sauvignon Blanc! Thanks for stopping by! Thank you Dawn! I’ve been looking forever for opportunities like this. Even the cooking clubs are very closed. I keep my ears open though. Thanks Debbie! I love to bake. There is just something therapeutic about it. If I was you I don’t think I would ever leave your deck. If it can’t be cooked outside, forget it! I’d say you earned an A, Julie! Gorgeous homework and photo!! A few Christmas seasons ago I had 12 friends come over to take a Pie class from my mom. a master at crust. She couldn’t believe the enthusiasm and eagerness of all these womwn at learning pie making. They all took home a masterpiece to share with their families. The problem is I was too busy organizing everyone and cleaning up, I actually did not partcipate! Time for another class! Thank you Johanne! What a great time! 12 people? Wow, I would say your mother paid it forward for sure. It’s a good thing that you have access to the instructor. I had such a wonderful time. John and I are talking about going back to Europe next summer, and I would love to get into a cooking class there.